Orders Placed before 4.30pm Monday to Friday will be shipped same day via our courier or postal service on a 1-3 day service depending on YOUR SELECTION AT CHECKOUT. Free delivery is 2-3 working days on a signed for service - tracking can be provided upon request. 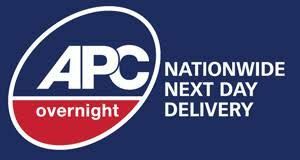 Next day is via APC couriers and requires signing for and to UK Mainland postcodes only. Remember to select option at checkout as not our standard free delivery service! Sometime we may need more information about your order and we reserve the right to place an order on hold pending further discussion and details. We reserve the right to refuse and refund an order. Although we do our best to stock high demand items When an item is is out of stock or unavailable, a member of the parts team will contact you with an estimated timescale for delivery or a option for a full refund. Customers can benefit from a FREE regular local delivery service, for more information in these areas, customers should contact a member of the team on 01827 426426 or alternatively - click the chat button or email us to take advantage of this service! If you want something delivered to somewhere hard to get to, for example anywhere outside UK Mainland (such as the Isle of Wight, Isle of Man) or in the Scottish Highlands - we will try our best to get your product to you in the most economical way. It's likely we will get in touch with you to discuss delivery options. Email us to confirm a shipping cost.